With the economy grinding to a lowly 1.1% last year and still shedding jobs, disposable income is under significant pressure, macroeconomic challenges continue to weigh on the Namibian housing market as annual price growth decelerated to 6.4% for the month of June. This is a substantial decline from 11.6% recorded from a year ago. This is even more evident in real price changes (i.e. 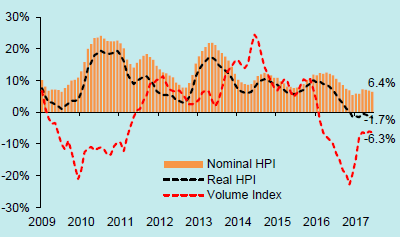 CPI inflation-adjusted) which has been in the red for the past seven months on the back of upwardly sticky housing inflation as measured by the Namibia Statistics Agency. Hence housing demand is faltering under this backdrop and is hardly surprising that properties spend on average 24 weeks on the market and when they eventually do sell 98% sell below the original asking price. That being said, housing demand should remain weak and affordability ought to become more challenging against this sombre macro-economic backdrop. This is evident in the volumes data, where for the 17th consecutive month, volume growth has remained negative as June volumes came in 6.3% lower than the same period last year. Hardly surprising, the upper income segment was hardest hit with a 43.4% contraction over the same period last year and according to our Q3 Estate Agent Survey, these properties average 27 weeks on the market. As it currently stands, the northern property market is the only market that has registered meaning volume growth in June, while the central and coastal market volumes are contracting rather rapidly as confirmed by our Q3 Estate Agents Survey. This is similar weakness evident post global financial crisis back in 2010, and given the current economic backdrop coupled with limited new developments outside the northern property market, we expect volumes to remain depressed for the remainder of the year, spilling over to 2018. Central market: The average nominal value of residential properties jumped 9.0% in June compared to a year ago. After adjustment for inflation, house prices were still up, albeit marginal, in the small and medium categories, but were down in the upper income segment (figure 4). 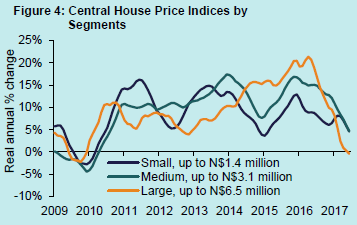 In the capital, prices were up 9.1% through June, with the average price now N$1 588 000. Gobabis saw house prices increase by 3.6% over the last 12 months to stand at N$775 000. In Okahandja - where volume of property transactions increased by 8.9% (thanks to the construction boom in that area) - the average price fell by 1.5% over the year to stand at N$848 000. Coastal market: The continued growth in the region is driven by the strong growth in Swakopmund and Walvis Bay, which both grew by 22% on an annual basis. 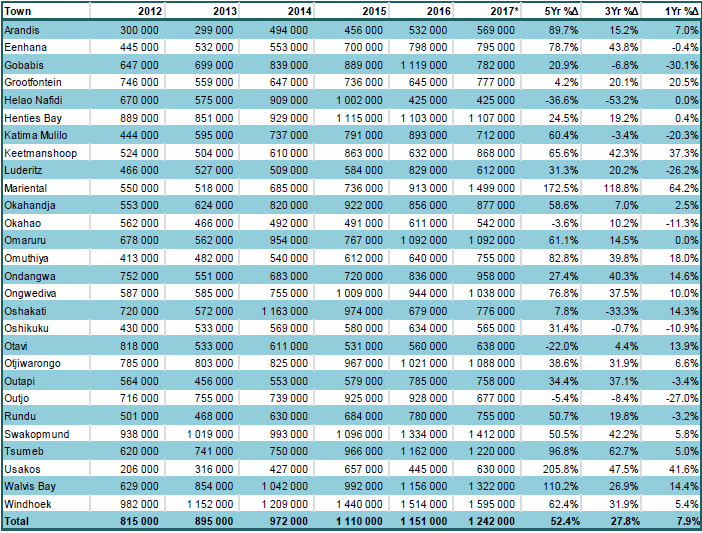 Walvis Bay’s N$1 259 000 average is third only to Windhoek (N$1 588 000) and Tsumeb (N$1 446 000); Swakopmund, meanwhile, ranks just below its neighbour, with an average price of N$1 164 000 on average. The growth, however, comes largely from gains in the upper segment of the market, which rose 34.5% and outpaced other similar markets. 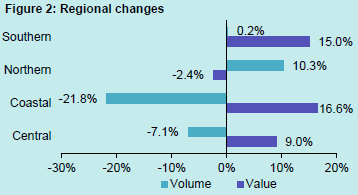 How did the volumes perform, and especially the lower price segment? Southern market: Southern property prices increased by 15% through June, while volumes remained almost unchanged and rather thin. In terms of segments, the market is predominantly active in small to medium segments, where prices rose by 16.2% and 29.4% respectively. Mariental led the growth, after posting 48.2% price growth, with prices now averaging N$568 000. The lowest annual rate of change in that region was recorded in Keetmanshoop, where prices fell by 13.2% to stand at N$890 000. We must however warn that the volumes are rather thin and that low volumes in some main towns can lead to substantial volatility as is the case with Mariental. Whilst efforts are made to account for this volatility, the change in price in these town levels can be influenced by the type and number of properties sold in any given period. Northern market: Northern house prices dipped for the third consecutive month, to average N$835 000 through June. Oshakati and Rundu prices fell by 29.6% and 20.5%, respectively and as such had a strong bearing on the overall picture in the northern region. What is clear is that residential construction activities are on the increase in the northern property market and it is this supply growth coupled with the weak economic backdrop that is pushing these property prices down. It remains to be seen whether this trend will precede a more widespread slowing of northern property prices. Initial impression is that it will, given the structural dependence of this market on government, which is consolidating its finances. Overall mortgage advances contracted by 1.2% in June. This was driven mainly by the 2.4% decline in total value of mortgage advances for first bonds. Therefore, further bonds are on the increase and it’s this increase that has softened the decline in overall mortgage advances. Given the financial pressures consumers are facing, this trend in rising further bonds is evident in the northern towns of Eenhana, Ondangwa, Rundu, Grootfontein and Okahao, and more prevalent in the small to middle price segments. According to the latest Knight Frank quarterly report, the global house prices increased by 5.6% in the year to June 2017. Iceland leads the index for the second consecutive quarter, after property prices jumped 23.2% year on year. 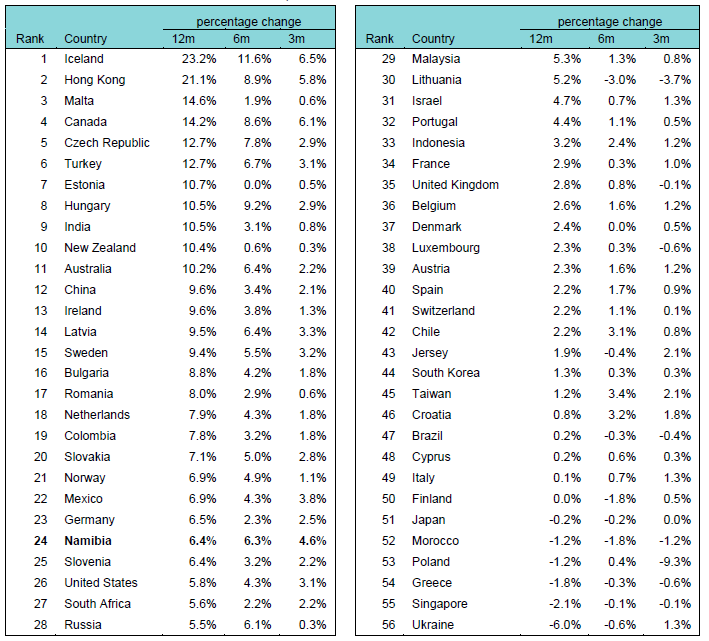 Perennial leader, Hong Kong was not too far behind after registering 21.1% annualized price growth, followed by Malta with 14.6% price growth. The nearer term 6-month and 3-month data points suggest that the growth impetus is waning across most countries. By our calculations, Namibia slots into the 24th position, above Slovenia and three places above its neighbor South Africa. Namibia’s near term data also points towards weakening growth. As the economy gradually recovers, growth opportunities remain limited to the primary sectors, where mining and agriculture are rebounding from poor performances last year. However, employment and income growth is still constrained and, coupled with low consumer and business confidence, weighing on housing demand. With average time on the market increasing to 24 weeks (27 weeks in the upper income segment alone), the residential property market has shifted from a sellers’ market to a buyers’ market, causing price growth to drop notably, save for the coastal market. Mortgage advances have consequently decelerated. Therefore, the prognosis for the domestic market is less favourable as we expect property prices to decelerate even further. Based on our estimates, property price growth should decelerate to 6.0% in 2017 as a whole and improve to 7.8% during the course of 2018 on the back of mild economic recovery. Although interest rates are unwinding, the expected deleveraging will keep price movements in check, with possible downside risks from the mass housing program as 1,942 mass housing units are ready for occupation and a further 4,012 currently under construction. This report is based on bonds registered in the names of natural persons at the Deeds Office and as such excludes all bonds registered in the names of juristic persons such as Close Corporations, Private Companies and Trusts. Rehoboth properties (Rehoboth has its own Deeds Office), farms, properties over 100,000m² and properties in industrial areas, are excluded, as these may not always be residential properties. Outliers below N$100,000 (2007 prices adjusted annually) are also excluded, along with further bonds (second, third, fourth, etc. bonds over the same properties). Exclusions were rigorously tested where possible using existing data. Cash transactions are, too, excluded due to a lack of data. Sectional bonds will be included into the housing index in due course to provide a comparable sectional property index. 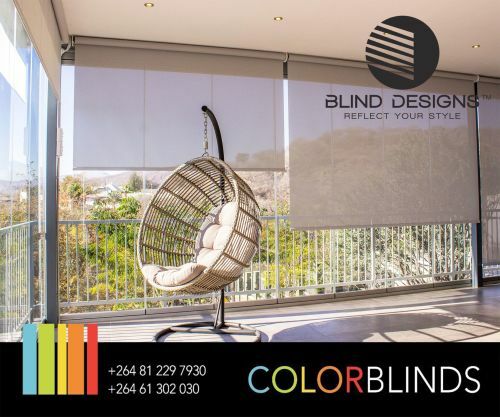 Bond values are used as a proxy for house prices, since there are no consistent records for house prices in Namibia and therefore prices shown should only be used as a general guide to property value. These values are aggregated by way of the average value as the central measure of tendency to resist the fluctuation between different prices. Average house prices are smoothed using a three month moving average, with the national value computed as a weighted average of regional prices. Whilst the information provided has been obtained from source believed to be reliable, the values quoted are indicative only and past performance should not be taken as a guarantee of future performance. Declaimer: The information in this publication is derived from sources which are regarded as accurate and reliable, is of a general nature only, does not constitute advice and may not be applicable to all circumstances. Detailed advice should be obtained in individual cases. No responsibility for any error, omission or loss sustained by any person acting or refraining from acting as a result of this publication is accepted by FNB Namibia Holdings Limited and / or the authors of the material.